Several schools, most private and a few quasi-public, sporadically served the children of Portland from the late 1840s through the mid-1850s. 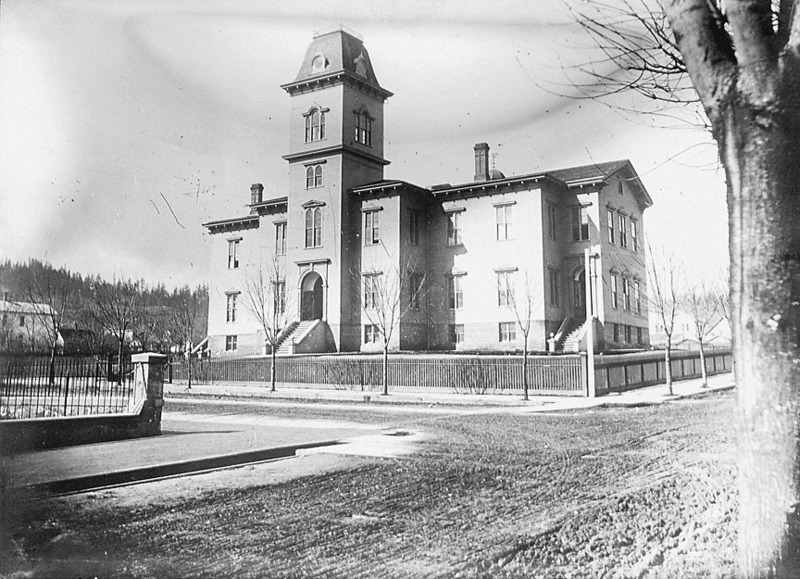 But finally on May 17, 1858 the Central School opened, the first public school in Portland in a building, and on land, owned by the school district. The school was constructed at 6th and Morrison, where Pioneer Courthouse Square is now. The first principal was L.L. Terwilliger, and he was assisted by Owen Connelly and Mrs. Mary J. Hensill. The first class had an enrollment of 280. Additional source: Portland Public Schools, 1845-71, but Charles N. Reynolds. Oregon Historical Quarterly, Vol. 33, No. 4 (Dec., 1932), pp. 334-347. I am really enjoying the history of Rosaria and Portland. I did not know that the first Queen of Rosaria from Portland high schools was from Lincoln High School. Laurelhurst Park is gorgeous and the Queen was crowned there. My, the Rose Festival has changed through the years and always has some new surprise added to it’s events. Thanks for sharing the history. I hope you continue to do this all year.